Click each image for additional photos. This rare banana hull Outrage is ready to restore or use as is. It has a new custom fuel tank. Yamaha V-6 runs great. Trailer included. This rare and beautiful Century Raven has received an "over the top" restoration which included custom mahogany decks and a new West System bottom. Please contact us for details. This very nice example has had a complete structural rebuild that included a new traditional bottom. A nice single axle trailer is included. Hull #003 may be one of the rarest Silver Arrows produced. 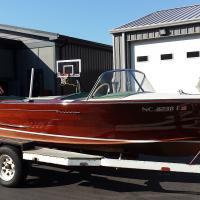 It is powered a completely rebuilt Chris Craft KFL 131 HP engine. The boat has received a complete and professional restoration from the keel up. A 5200 "no soak" bottom was installed. This may be one of the best in the country so do not hesitate to contact us for details. 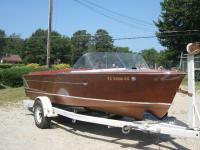 This beautiful example of a 1957 18' Chris Craft Continental has been restored from the keel up including a 5200 "no soak" bottom. The KFL 131HP engine has been completely rebuilt with very little running time. Please contact for details. 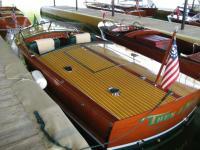 This gorgeous 1934 18' Chris Craft Custom Runabout is in show condition. Please contact us for details on this very special offering. 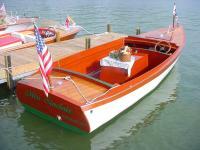 This beautiful Chris Craft Sea Skiff is one of the nicest examples we have seen. It is fully restored which included an upgraded bottom. A nice aluminum trailer is included. Please contact us for details on this special offering. 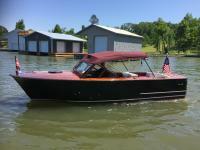 This beautiful example is in the water and ready to enjoy. Please contact us for details on this very special offering. This absolutely pristine Chris Craft Launch is ready to enjoy. Always a freshwater boat her hull is a rare “Fighting Lady” yellow. Please contact use for details on this very exclusive offering. The very nice example has been completely restored which included a 5200 bottom and rebuilt engine. Please contact us for details. This rare and beautiful example has benefited from loving owners who prepared it for the Great Loop. It has accomplished this and ready for a new adventure and a new owner. Please contact us for details on this very special offering. This very original Corbra had one owner from 1955 to 2005. Please contact us for details on this very exclusive offering. 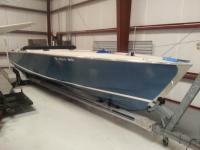 This beautiful example has been completely rebuilt which included a 5200 bottom. Show or just enjoy. A restored tandem trailer is included. This beautiful example is ready to show or just enjoy. Power is the super rare Cadillac. A custom trailer is included. Please contact for details on this very special offering. The ultra rare Chris Craft is one of a handful that remain. It has be professionally restored to a high standard and is ready to enjoy. This very rare Chris Craft racing pram is in very good condition. 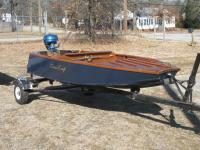 Included is the outboard and trailer. 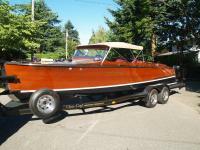 This beautiful and rare Chris Craft Cadet is ready to enjoy. 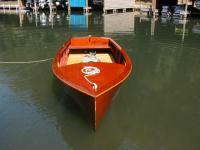 The boat has had a complete restoration which included a 5200 bottom. The trailer shown is NOT included. Please contact us for details. REDUCED! 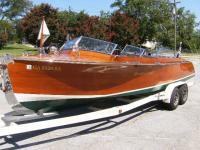 This ultra rare Chris Craft is museum quality including its original Kermath 150 engine. Please contact us for details on this very exclusive offering. This rare Chris Craft Holiday is ready to enjoy. A solid trailer and full cover are included. REDUCED!! 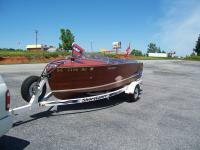 This is a very nice Chris Craft ski boat that is ready to go. Power is a great running Chris 283/185HP engine. 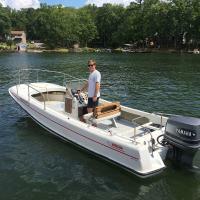 This ski boat would make a great all around family boat. A single axle aluminum trailer is included(not the steel one pictured). 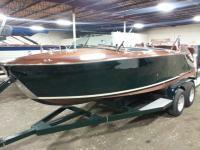 This beautiful 20'Riviera has just received a complete keel up restoration and is ready to win awards or just enjoy. Please contact us for details. 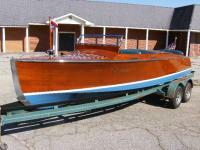 This beautiful Chris Craft replica has been maintained to a very high level and it shows. Please contact us for details. This very nice barrel back has been boat house kept and is ready to enjoy. A solid tandem trailer is included. 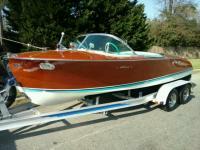 This Chris Craft Continental is in overall good shape. Please contact us for details. REDUCED!!! Less than five hours running time on an award winning restoration. Why wait two years on a restoration when this one is so fresh? The rock solid Chris Craft Commander FXA-35-0101 has been completely serviced and is ready to enjoy. The boat is equipped with a late model generator and reverse cycle air and heat. Please contact us for details.REDUCED! 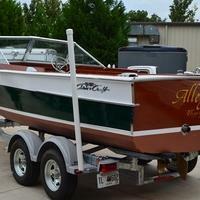 This show quality 20' Riviera is a must see! It has undergone a full keel up restoration. This very rare Dodge is in beautiful condition. Please contact us for details on this very special offering. Based on their 1890 design this beautiful all electric Elco is ready to enjoy. It has received all new electrics including motor and batteries. Please contact us for details. MAJOR PRICE REDUCTION!!! This one of a kind runabout is spectacular. A full show quality restoration has been completed which included a 5200 bottom. This boat has some interesting history in the Port Huron, Michigan area. A nice trailer is included. PRICE REDUCTION! 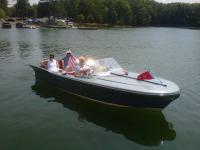 This very nice example of a Garwood Ensign is ready to enjoy. It received a full restoration which including a 5200 bottom. A nice single axle trailer is included. 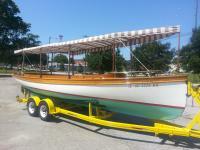 Please contact us for details on this wonderful and rare boat. 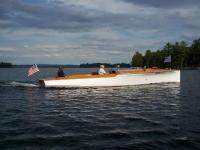 With only two examples known to exist this beautiful Goodhue and Hawkins Laker is a very rare boat.She is ready to enjoy. Please contact us for details on this very special offering. This beautiful Grand Craft is ready to enjoy. With a powerful 427 V-8 for power she is sure to please. A nice custom trailer is included. 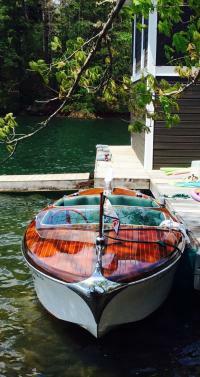 This spectacular restoration has yielded a beautiful 1965 Hydrodyne runabout. It must be seen in person to appreciate the attention to detail. 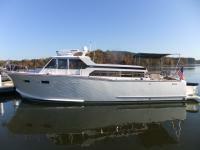 Please contact us for more information on this outstanding classic glass boat. 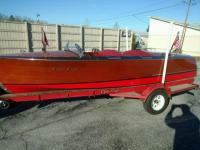 This rare fiberglass Lyman is a big and deep. It makes for a excellent platform to fish from or a great day boat. A triple axle trailer is included. 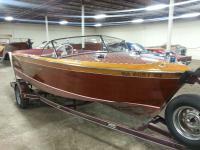 This super rare fiberglass Packard runabout is a freshwater low hour boat. Please contact us for details. Only three of these boats were built in 1965 and they were some of the first to fiberglass used in their construction. This is a beautiful example and it is ready to show or just enjoy. 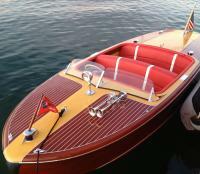 This very nice example of a 1960 21' Riva Ariston is ready to enjoy. REDUCED! Please contact us for details. Zero hours on this restored and rare Sea Lyon. Please contact us for details on this very special offering. This rare example has been restored and boathouse kept. Please contact us for details on this very special offering.